I purchased Peach Punch at Big Lots and boy did it smell great the moment I smelled the wax. The candle itself looked like Bath & Body Works 3 wick candles. Same size, same 3 wicks, just different labeling. The label on the bottom of the candle also says this brand is exclusively made for Big Lots and the price… super reasonable. I paid not even $5 dollars for this candle. Major score if you’re on a candle budget. I couldn’t find a scent description for this fragrance but just imagine an effervescent peach scent and you have Peach Punch. It smelled bright and very fresh. The peach was strong too so that definitely is the dominant scent. I lit this candle in a small bathroom and that’s where it stayed till the last drop of wax. Once the wicks were lit, it took about 20 minutes to reach a full melt pool and the aroma… a sweet and tart peach. 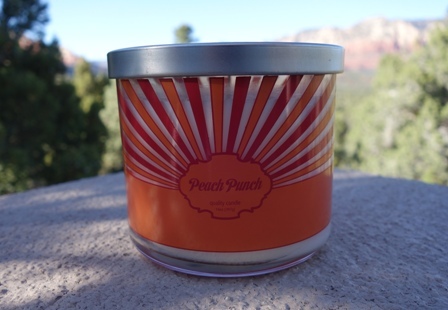 The scent name was very apt… peach punch. That’s exactly what it smelled like. ? Surprisingly, the strength was pretty decent too. This candle fragranced my bathroom and even spilled out into the hallway beyond. Not bad for a $5 dollar candle I purchased at Big Lots. I enjoyed this candle and would totally purchase it again. Can’t beat the price, that’s for sure and the scent and strength was pretty decent burning in a small room. Definitely check out this scent if you see it in a Big Lots store. You may walk away with one… or two. ?